YOU can demonstrate to our vulnerable, but resilient youth, that they have promise and the support of caring adults. Your support means that we can continue to provide housing, basic needs, and support services for as long as our youth and young adults need us. Please help us remain a place of nurture, hope, and wellness. 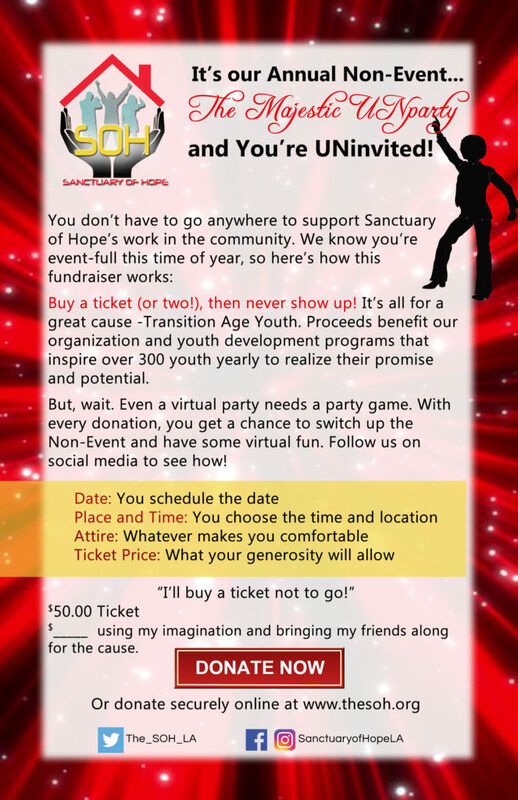 Sanctuary of Hope is a 501(c)3 nonprofit public benefit corporation. All donations are tax deductible. Monthly support from generous SOH partners like you provides us with the kind of predictable funding we depend on in order to fulfill our mission. For your convenience, you can give a recurring gift. Just click on the button below to access our secure, on-line giving to complete your transaction. If a selection you desire is not available, give us a call. Recurring Gift Option – Select below and click recurring donation button. Make a stock gift to SOH and receive a significant tax advantage. You will receive an income tax deduction based on the full market value of the stock on the day that SOH receives it. Check with your tax advisor for specifics. Make a contribution to honor family, friends and colleagues or in celebration of a special occasion. Many employers sponsor matching gift programs that extend your ability to give. Check with your company’s human resources or payroll departments to see if there’s a matching gift program in place. Consider making a planned gift that will leave a legacy of support. Planned gifts helps you meet your estate and financial planning goals while providing a helpful benefit to our programs. Donate Items– Help us meet emergency needs for our youth by donating college school supplies, food and supply gift cards, new bathroom and kitchen towels, new laundry baskets, laundry detergent, ironing boards, and toiletries. SOH Booster – Raise funds and plan celebratory activities for our program. Examples include decorating our building for the holidays, securing gifts for young adults moving into their own apartments, culminating from education programs, recognition events, or rewarding our young adults for a job well done. Download our in-kind donation form.